Nature is filled with a feast of items, thanks to God. Right now we're snacking on mulberries from our yard, non-stop. 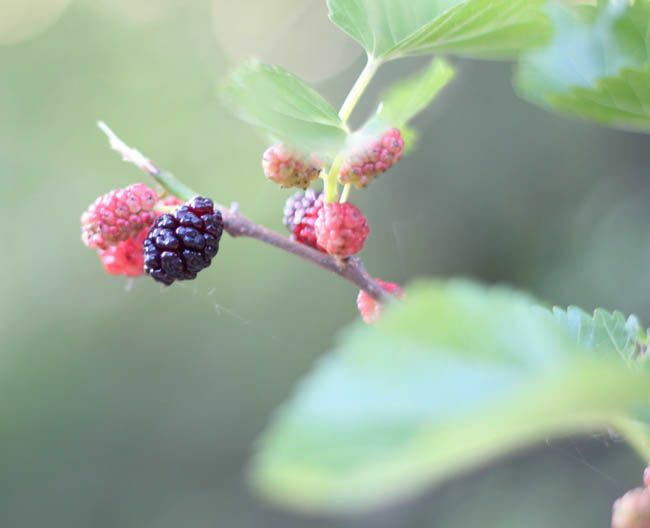 Wow, mulberries in your own backyard -- cool! We used to have a mulberry tree on the edge of our yard...but it hung too much into the street, so the city cut it down. We were not happy. Yum! Love when it's berry season. How do you keep the deer from eating them all? Mmmm! Do you have a strawberry patch too? Someday, I want one ... when we have a yard. :) It's great to find God in the "little" things. Nothing is little with him, but mulberries growing in your yard is just as special as other things that we see as "giant" fingerprints. God is truly everywhere! They look delicious..We will have a big crop of raspberries this year..can't wait. The bushes are full. So many fingerprints..and so thankful.. I am so happy that you are enjoying your farm life and all the wonders of it. They look delicious! That is great to have them right in your own yard.